I have always loved a good Jesus novel. Trouble is, there are so few of them. The gospels give us the basic narrative of the life of Christ, but we want more, don’t we? I’m hoping that in the life to come we’ll be allowed to travel back in Earth-time, because I want to know what kinds of games the boy Jesus played with his friends, what childhood illnesses he had, what were his favorite treats? Was Jesus the only non-obnoxious teenager who ever lived, or is obnoxious not necessarily sinful? As a man, what were his distinctive quirks? I want to know how the different emotions looked on his face, what did his laugh sound like, what did it look like when “Jesus wept”? In my quest to find writers who’ll help me imagine the earthly Jesus, I’ve come across some real stinkers. There have also been some good ones: I had high hopes for Anne Rice’s Christ the Lord series, which began with the six year old Jesus in Out of Egypt and moved on in The Road to Cana to the moment where his public ministry was poised to begin. Sadly, Rice seems to have abandoned the series for other projects. I’m sure Jesus wept over that decision—or that may have been me—and I figured I’d have to make do with lesser efforts. But that was before I found D.L. Maynard. Oh, frabjous day. Dee Maynard has written by far the best Jesus novel I’ve ever read. My only problem is figuring out which of her six-plus books that might be (“six-plus” because there are a couple of short stories in addition to the two series). The Talmid trilogy is the story told by John son of Zebedee. The Immanu’El series tells Jesus’ story from the perspective of his family: The Carpenter is Joseph’s view, The Voice is that of his cousin John the Baptist, and Brothers alternates between the voice of Jesus and that of his brother. A fourth book in the series, Son of Man, will be narrated by Jesus himself, and when it hits the shelves I’ll be first in line to buy it. Let me count the reasons why: First, Maynard does more than any author I’ve ever read to give us a Jewish Jesus. This is not some generic Jesus who could be anyman, from anywhere, onto whom any of us could project our own cultural baggage. This is the story of a first century Galilean Jew who was brought up in a specific religious, cultural and political context. I am using the conventional English names for biblical characters here, but in the books Jesus is Yeshua, his cousin John is Yochanan, and so on, and the frequent use of Hebrew and Aramaic serves as a constant reminder of time and place. Second, Maynard doesn’t resort to biblical clichés, like having Jesus fall in love with a hot prostitute named Mary Magdalene. She does deal with the fact that a man of his time and place would have been expected to marry, but her treatment of this sensitive issue is more skillful and nuanced than any I’ve seen. Third, Maynard does an exquisite job of imagining the intersection between the divinity and humanity of Christ. When faced with temptation—not just the Big Ones in the desert, but the everyday ones as well—we are let in on the process he goes through to avoid sinning. A particularly moving example of this is when a Zealot who’s harmed Jesus’ family is being crucified. Jesus sits at the foot of the man’s cross, tempted to hate him but willing himself to find a way to love him. He succeeds, just as he bears without sin the humiliation of those who’ve never forgotten Mary’s premature pregnancy and won’t let Jesus forget it either. Bearing abuse doesn’t come easily just because Jesus knows whose son he is; in fact, he often strains to hear his Father’s voice, and has to content himself with silence. Just like us. All of us “who have not seen, but have believed” have to use our imaginations to get to know Jesus, even if we read nothing but the gospels. Our minds take the gospel narratives and fill in the empty spaces: Jesus is teaching in the Temple: what was the Temple like? Jesus curses a barren fig tree: what led up to that? And what about his friends? What was it like for Mary Magdalene to go from “having seven demons” to being the Apostle to the Apostles? As the Ignatian spiritual exercises have shown countless people through the years, to enter imaginatively into the gospel stories can powerfully draw us close to Christ. What D.L. 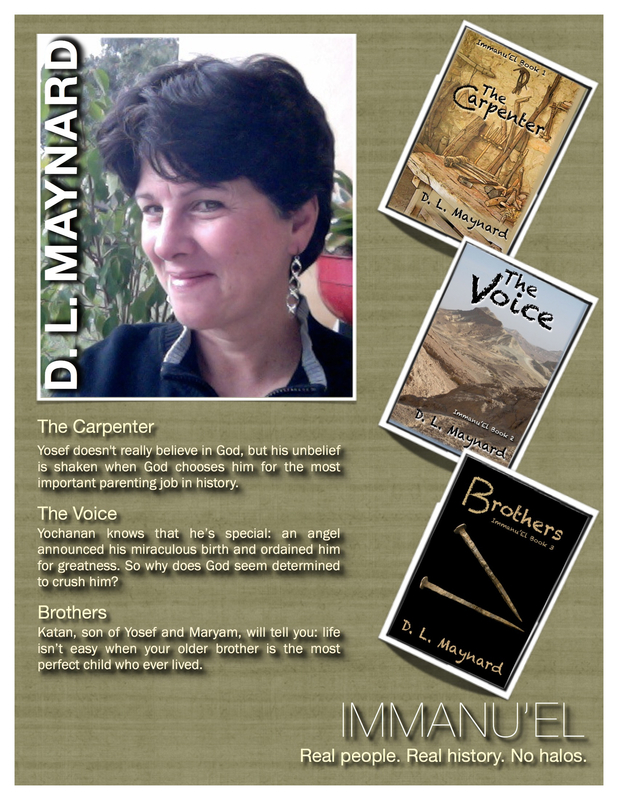 Maynard has done in her books is offer us a highly skilled imagination, sanctified by a passionate love for God, plus serious research and remarkable skill as a writer, to create works that bring Jesus close. Consider spending Lent with them. As a rich, extended meditation on Christ’s earthly life, they’ll be great preparation for greeting him anew at the empty tomb.